Dear flash sales, where are you? Qatar uses a short haul plane for the relatively short journey from Belgrade to Doha, which will either feature a reclining seat or a fully flat bed. On the long haul from Doha to Shanghai, you’ll enjoy Boeing 777 QSuites in both directions. Flights 870, 871 each have QSuites. Dates: Availability is wide open between December 2018 and November 2019, with the exception of August 2019. Link: Book with Qatar here by entering BEG – PVG. While not a cash deal, it’s important to note that you can use just 37.5k points in each direction for QSuites when they debut on the Frankfurt-Doha route on May 1st, 2019. All Boeing 777 flights between the two cities will feature QSuites, and starting in Doha, surcharges are minimal. 6+ hours of QSuites for 37,500 Amex, Chase or Avios Points is fantastic..
Qatar flights 944, 945, 946 and 947 between Doha and Singapore offer the amazing QSuites on the ultra quiet Airbus A350. The shorter journey between Sofia and Doha will be on a short haul A320, but may also feature beds, just not QSuites. Dates: These deals are wide open from now until May, and return again with great availability in September. Link: Book with Qatar here by entering SOF – SIN. 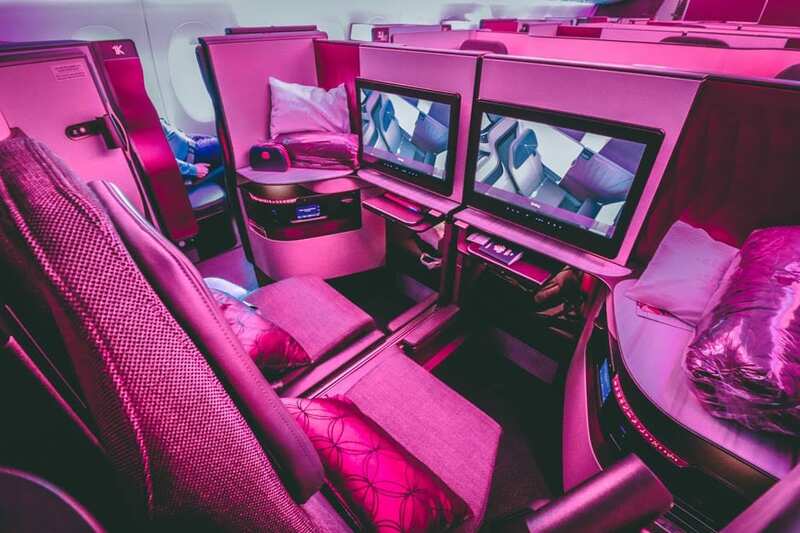 Stockholm – Doha flights 171, 172 and select Qatar flights to Sydney operated by the Boeing 777 now feature QSuites as early as March 2019. Do note: the A380 features a cool bar, but no QSuites – yet. These “deals” aren’t cheap, but offer incredible comfort on the long haul to Australia. Dates: Mid January 2019 thru May is wide open, as are dates after September 2019. Summer is tough. You could enjoy QSuites the entire way if you book right! Be sure to use ExpertFlyer seat maps to look for the staggered QSuites seating. Link: Book with Qatar here by entering ARN – SYD. These are far from the best deals we’ve ever seen from Qatar, but are very reasonable prices given the levels of service and luxury. You wouldn’t be crazy to hold out hope for another flash sake, but if you’re pressed to book, these are your best bets. Last year, Qatar’s best sales came on December 7th, and 8th. It can always be worth burning a few points to position to one of these cities to take advantage. Took advantage of one that you wrote about sometime ago Muscat to Bangkok Amazing service and great lounges in Doha.Waiting patiently for the next blockbuster. Where’s Qatar’s previous under £600 biz Europe to Bangkok or £900 biz Europe to Sydney ?